Kelly Makin is making her own name at the University of Washington. Ember Stratton returned to her native Montana for her senior season. The Sunset girls cross country squad truly belongs to junior Lucy Huelskamp. It's her team, her time. And so far this season, the star runner has carried the Apollo mantle with authority. Huelskamp won her fifth individual meet of the season on Oct. 17, racing to a 17 minute, 55 second first place against defending Class 6A and archenemy Jesuit at Sunset High School. The Apollo beat Jesuit senior Makenna Schumacher by 14 seconds on Sunset's home course, rubber-stamping her most important victory of the season to date. Huelskamp holds the third-fastest time in 6A, just 10 seconds behind Lincoln senior Kyla Becker who boasts the best state mark at 17:24. She and Schumacher are great competitors both in track and cross country, two runners who push each other's physical and mental limits in the grueling long distance races. Junior Alexis Kebbe and freshman Chloe Foerster finished fourth and fifth for Jesuit. Seniors Greta Anderson and Libby Rinck were seventh and eighth and sophomore Olivia Silenzi took 10th. "Knowing (Jesuit) is there is really helpful to push us all," Huelskamp said. "It was a fun race, it's always great to race Jesuit. They're really good competition." The Apollos lost 26-40 as a team, but still crammed six of their runners into the top-15. Jesuit, on the other hand, finished with six of its runners in the top-10 to take the team sweep over Sunset and Westview. 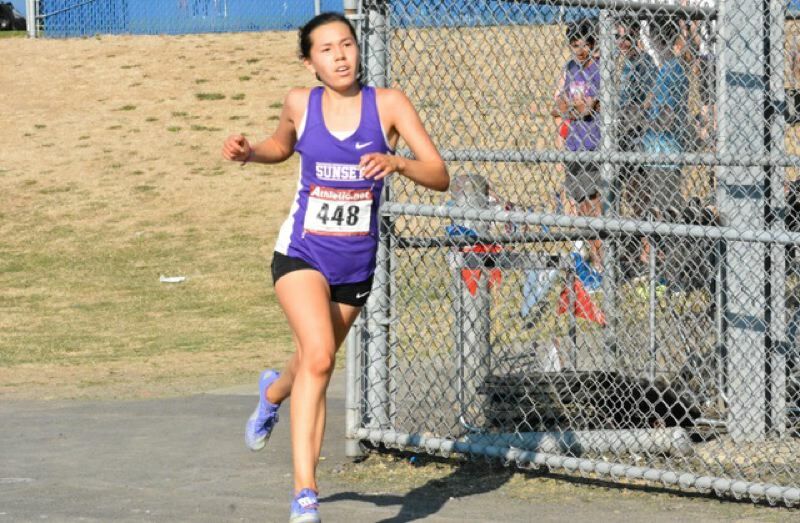 Sunset junior Jasmine Wang (18:42) finished sixth for the Apollos. Senior Na'ama Nevo (19:49), freshman Eva McIlraith (20:04) and junior Sophie Gardner took 10th through 12th, respectively. "I feel like we put up a fight," Wang said. "We always have the mindset of doing our best no matter who our competitors are. I'm really proud of the work we put in today." Jesuit and Sunset are the class of the Metro League, two teams that are annually in the state's top-three year-in and year-out. Until Summit moved up to the 6A echelon, the Apollos and Crusaders were each other's biggest hurdles to both Metro and state prominence. Few programs are as consistent when it comes to success. Yet, the jostling is far from cutthroat. "It's a very respectful energy," Wang said. "We both know we're very powerful and very tough competitors. I feel there's a very sincere respect toward each other. There's definitely a competitive side, but we try to recognize how well they're doing and try to do our best to work hard against them." 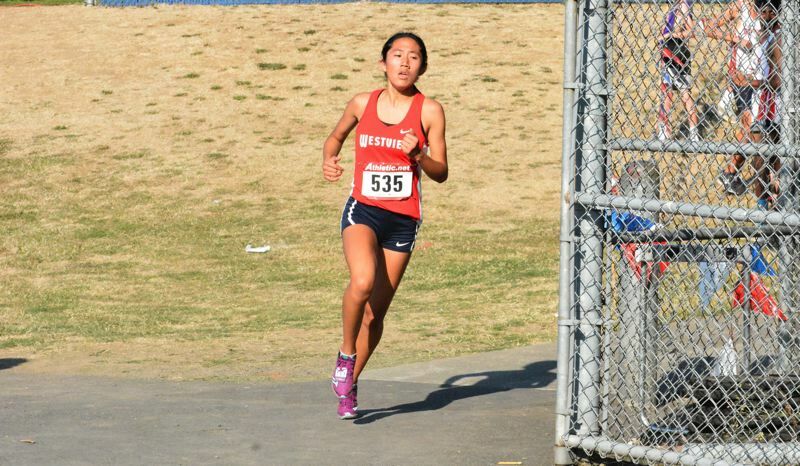 Westview junior Irene Nagasaka ran an 18:30 and finished third for the Wildcats. Senior Emily Taylor took 16th (20:33) for the Wildcats and junior Alisha Bryant ran a 21:06 for 20th overall. Huelskamp said she took a wait-and-see approach to the race, hoping to gauge who wanted to take the lead early and how fast they hoped to take the first pack out. Wang was happy with her strong beginning to the race and hopes to train herself to sprint toward the tail end of the competition. As a team, Huelskamp said the focus was bridging the Apollo packs and bringing them closer to one another. "We're trying to close the (time) gaps within our team and I think we've done that throughout the season, Huelskamp said. "We're trying to push everyone toward getting faster by working together."